See also: Great Trading Path; Trading Ford. The oldest paths and trails in the area that became North Carolina were made by animals in search of food, water, and salt; and native Indians adopted these paths for the same purpose. As agriculture evolved, life became more settled for many groups, and paths developed between major settlements and villages. Long before Europeans approached the New World, these paths were traveled by Indian ambassadors, war parties, couriers, traders, families, and even whole communities. Precisely when trading began among native peoples is not known, but it is clear that the Indians of the area traveled widely. As tribal groups established territories they considered their own, exchanges developed on a more or less regular basis, with traders traveling by foot, carrying those items most in demand. The Coastal Plain, Piedmont, and Mountains each produced items desirable for trade, generating contact among the native peoples of the three regions as they exchanged goods, often at feasts and ceremonies. From the coastal regions, shell beads, especially conch shell beads known as wampum or roanoke, had relatively fixed values and served as a medium of exchange. Leaves of certain hollies found along the coast were a standard trade item, and coastal salt was frequently traded inland. Coastal and piedmont Indians also supplied hardwoods for bows, minerals for paint, and stone for weapons and tools. The Catawba exchanged skins and mica with coastal tribes in return for fish and salt. From the mountains came heavy bear and buffalo skins, copper, and mica. In addition to raw materials, some man-made goods were traded. The Tuscarora, for example, made wooden utensils to exchange with other tribes for uncured deerhides, which they tanned and traded elsewhere. The Cherokee became known for their carved stone pipes. A new trading era began when Indians were exposed to European goods: guns and ammunition, hatchets, kettles, metal tools, liquor, woolen cloth and blankets, trinkets, and glass beads. In return for these goods, Europeans traders wanted furs and hides from beavers, otters, deer, muskrats, and raccoons. As long as there were plenty of animals, the Indians fared well in bargaining, often trading hides for firearms. But when animals became scarce, Indians were left without a medium of exchange for the trade goods on which they were increasingly dependent. The historic record makes it apparent that the Europeans often took advantage of the Indians in trade transactions. English traders often named Indian paths and trails after their destinations. Thus, the primary trails crossing North Carolina along the north-south axis were the Peedee, Catawba, and Cherokee Trails. One part of the Catawba Trail was called the Occaneechi Trail (sometimes referred to as the Great Trading Path), and another was called the Waxhaw Trail. The Peedee, Catawba, and Cherokee Trails generally correspond to portions of modern-day interstate highways 95, 85, and 40, respectively. Watersheds and river crossings, more than any other factors, dictated the route of Indian trading paths. For travelers who moved north and south-as did most of the English traders, explorers, and adventurers who first encountered the native peoples of North Carolina-rivers were unavoidable barriers. Fording them, the act of crossing streams without bridges, was a daily risk. Some of the river fords employed earned lasting place-names, such as Nations Ford on the Catawba River, Trading Ford and Shallow Ford on the Yadkin River, Piney Ford on the Haw River, Fish Dam Ford on the Neuse River, and Moniseep or Horse Ford on the Roanoke River. Many of North Carolina's modern highways lie within mere feet of the ancient Indian trading paths. For example, Highway 158, which runs from Kill Devil Hills on the Outer Banks to the mountains at Mocksville in Davie County, once connected the natives of the Albemarle with the Cherokee and all the tribes in between. East of the Haw River, Highways 10 and 70 run along the course of the Great Central Coast Road, down the watershed between the Neuse and Cape Fear basins; Highways 1, 15, 29, 64, and 74 likewise follow lines forged by people far beyond memory. 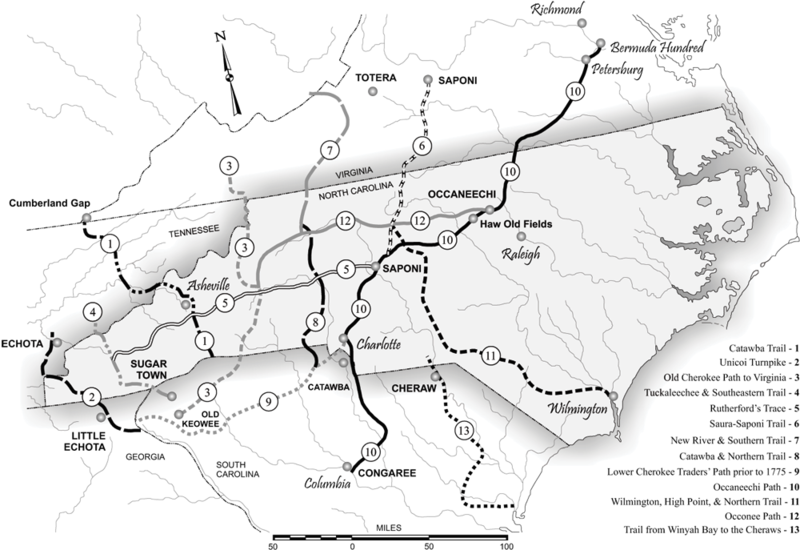 Eighteen Indian trading paths have been identified as having lain totally or partially within the present boundaries of North Carolina, including the Unicoi Turnpike, the Catawba Trail, the Saura-Saponi Trail, and the Lower Cherokee Traders' Path prior to 1775. Many of these paths extended into the states of Georgia, South Carolina, Tennessee, Kentucky, and Virginia, knitting the peoples of North Carolina together with those of the rest of the Southeast and North America. Beginning in 1941, the Department of Archives and History erected highway historical markers for many of these paths. William E. Myer, "Indian Trails of the Southeast," in U.S. Bureau of American Ethnology, 42nd Annual Report, 1924, 1925 (1928). Theda Perdue, Native Carolinians: The Indians of North Carolina (1985). "Photo of a group in the U. S. National Museum, Washington, D. C. Captain John Smith and companions trading with the Indians in Virginia, 1607. 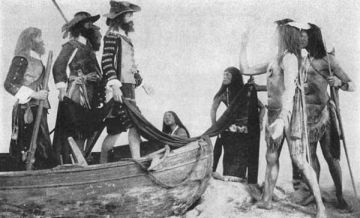 The colonists seek corn and furs from the natives in exchange for beads, trinkets, utensils and cloth." Image courtesy of Project Gutenberg book "Domestic Life in Virginia in the Seventeenth Century", by Annie Lash Jester. Available from http://www.gutenberg.org/files/27482/27482-h/27482-h.htm (accessed May 23, 2012). 1 January 2006 | Magnuson, Tom; Williams, Wiley J.
I am writing a book about the history of Blowing Rock and I have a two par question. The trail number 3 where did that information come from and the next part is how do I get permission to use the map in the book.